Natural calcite from Kuerle, Xinjiang, China, shows orange-red fluorescence when exposed to short-wave ultraviolet (UV) light (Hg 253.7nm). 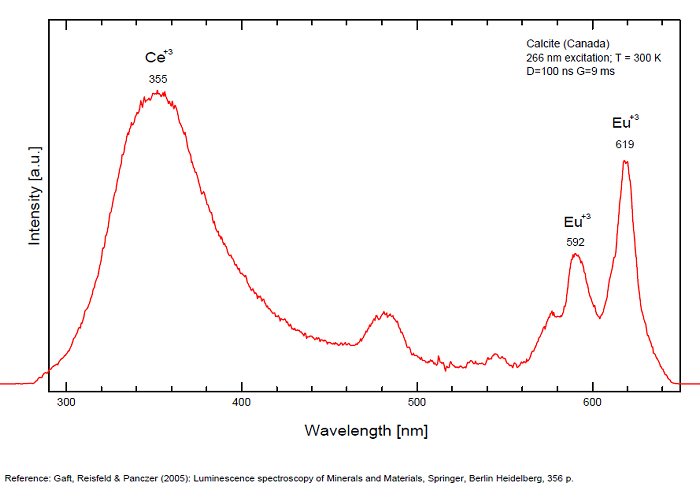 Photoluminescence (PL) emission and excitation spectra of the calcite are observed at room temperature in detail. 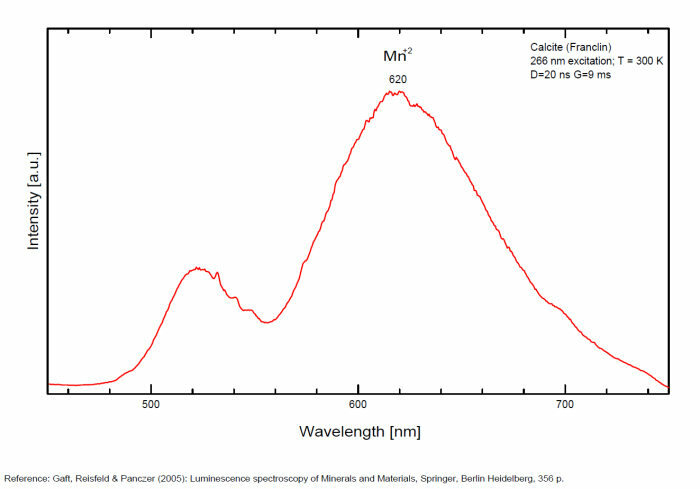 The PL emission spectrum under 208 nm excitation consists of three bands: two UV bands at 325 and 355 nm and an orange-red band at 620 nm. The three bands are ascribed to Pb2+, Ce3+ and Mn2+, respectively, as activators. The Pb2+ excitation band is observed at 243 nm, and the Ce3+ excitation band at 295 nm. The Pb2+ excitation band is also observed by monitoring the Ce3+ fluorescence, and the Pb2+ and Ce3+ excitation bands, in addition to six Mn2+ excitation bands, are also observed by monitoring the Mn2+ fluorescence. These indicate that four types of the energy transfer can occur in calcite through the following processes: (1) Pb2+ → Ce3+, (2) Pb2+ → Mn2+, (3) Ce3+ → Mn2+ and (4) Pb2+ → Ce3+ → Mn2+. 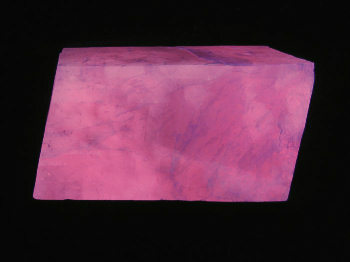 The unusual luminescence of particular varieties of natural pink calcite (CaCO3) samples was studied by laser-induced time-resolved luminescence spectroscopy at different temperatures. The luminescence is characterized by intense blue emission under shortwave UV lamp excitation with an extremely long decay time, accompanied by pink-orange luminescence under longwave UV excitation. 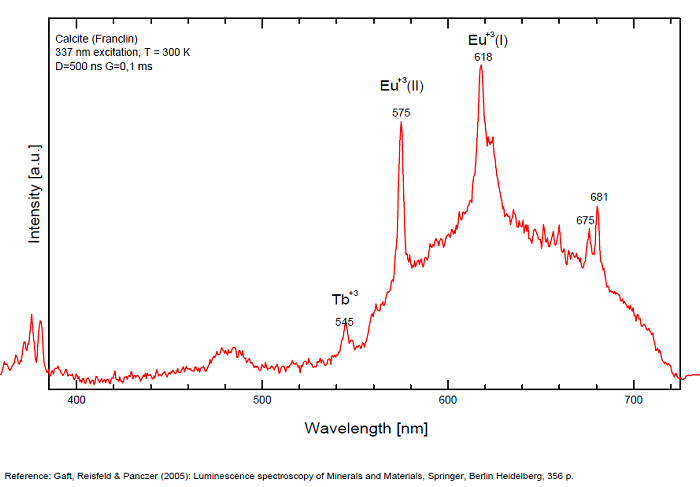 Our investigation included optical absorption, natural thermostimulated luminescence (NTL) and Laser-Induced Breakdown Spectroscopy (LIBS) studies. Two luminescence centers were detected: (1) a narrow violet band, with max = 412 nm, = 45 nm, two decay components of 1 = 5 ns and 2 = 7.2 ms, accompanied by very long afterglow, and an orange emission band with max = 595 nm, = 90 nm, and = 5 ns. Both luminescence centers are thermally unstable with the blue emission disappearing after heating at 500 °C, and the orange emission disappearing after heating at different temperatures starting from 230 °C, although sometimes it is stable up to 500 °C in different samples. Both centers have spectral-kinetic properties very unusual for mineral luminescence, which in combination with extremely low impurity concentrations prevent their identification with specific impurity related emission. The most likely explanation of these observations may be the presence of radiation-induced luminescence centers. The long violet afterglow is evidently connected with trapped charge carrier liberation, with their subsequent migration through the valence band and ultimate recombination with a radiation-induced center responsible for the unusual violet luminescence. Most common orange-red fluorescence is due to divalent manganese, with a co-activator to absorb the UV and transfer the energy to the manganese. Most common co-activator is probably lead. Cerium can act as a co-activator, suspected when the fluorescence is stronger with long wave UV. 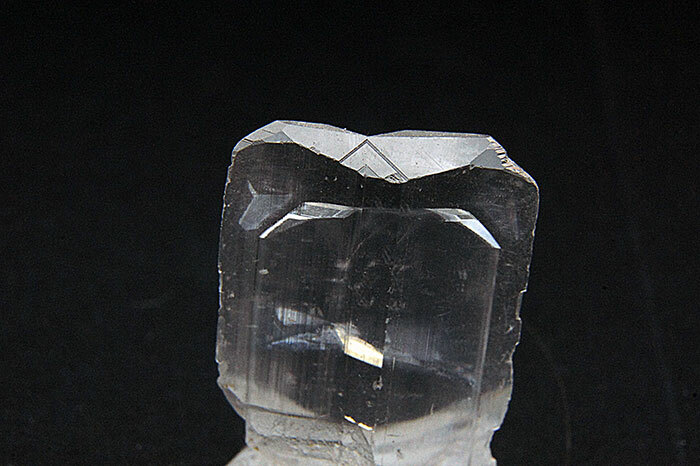 Magnesium in the calcite will shift the spectrum a bit to the red side. Some calcites fluoresce closer to orange. Both trivalent dysprosium and trivalent samarium are said to be capable of producing orange fluorescence. Pink or yellow fluorescence with a greenish phosphorescence is suspected to be caused by organic activators. Green may be due to interstitial inclusion of mineral activated by uranium (often hyalite). 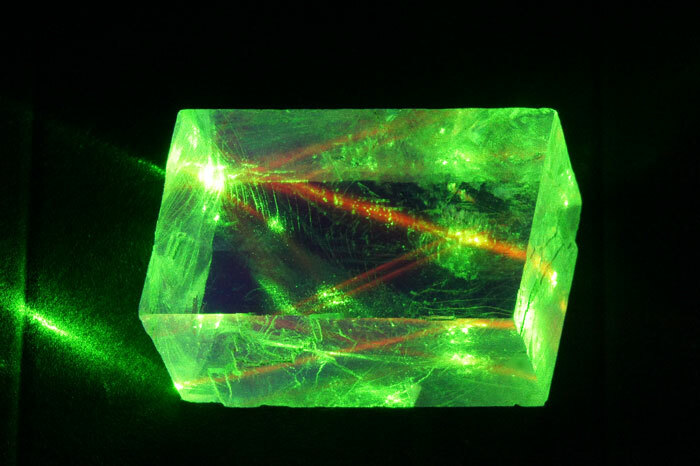 Stokes (1852) was unable to observe the fluorescence of calcite. 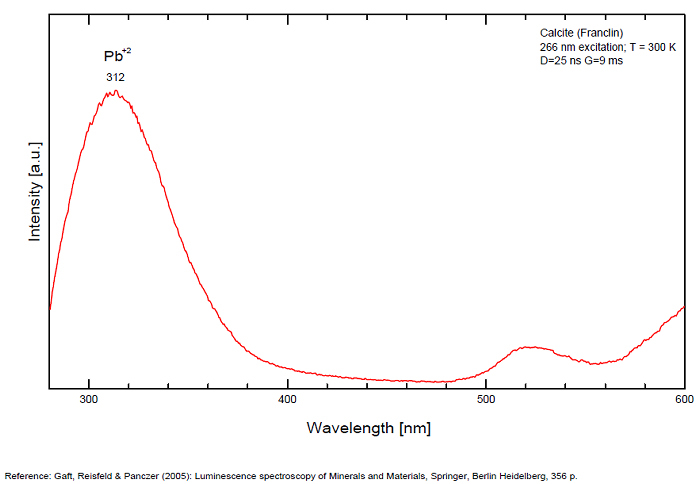 In 1859, Becquerel found that fluorescent calcite contained up to 2,7% Mn. In 1867 he studied calcite with his new phosphoroscope measuring a 0,5s for phosphorescence. Lommel (1884) studied calcite using sun as UV source and in 1909, Pochettino employed cathode ray to study the fluorescence of calcite. 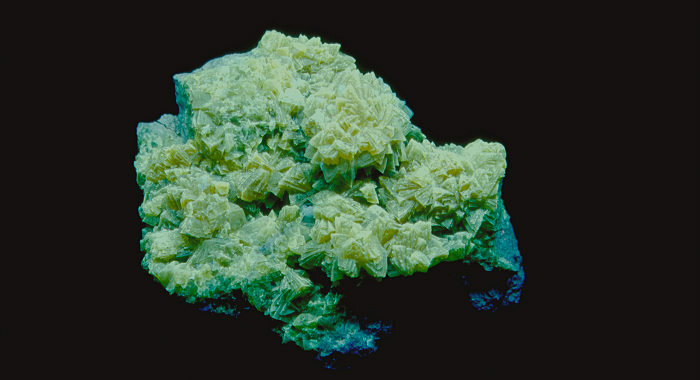 Sohncke (1896) while investigating polarized fluorescence found calcite from Iceland showing a marked fluorescence. Nichols, Howes and Wilbur were of opinion that Mn traces cause the luminescence of calcite and demonstrated this with certainty in later investigations. Tanaka working in the Cornell Laboratory (1924) also concluded that the chief activator in calcite, crystalline limestone and dolomite was manganese. 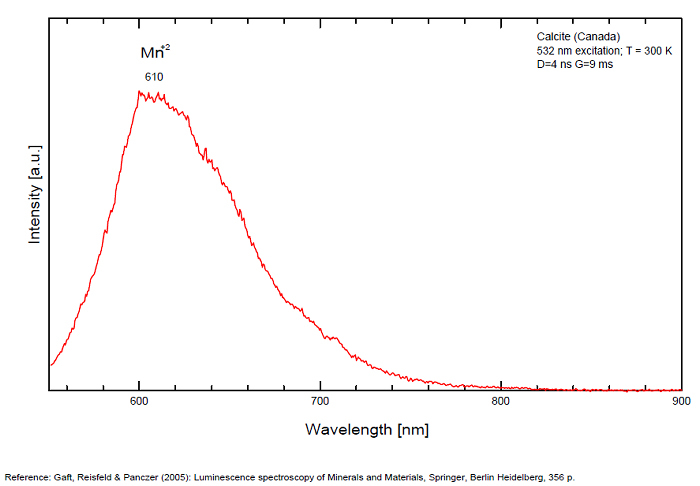 Pringsheim (1928) found also Mn as the most important activator in calcite. 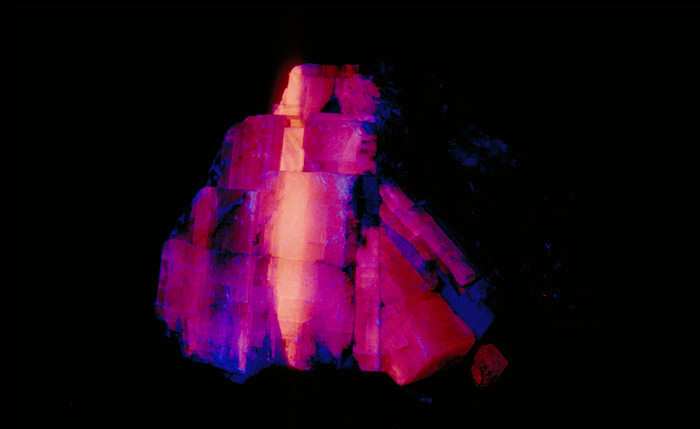 In 1939, G. Fonda made the synthesis of fluorescent calcite by precipitation of calcium carbonate in presence of a manganese salt. But the product is not exactly as calcite in nature. Another technic used to obtain fluorescent calcite is to firing a small amount of manganese salt (about 0,005%) in calcium carbonate for about one hour at 1000° (in an atmosphere of carbon dioxide). In 1943, De Ment identified the uranium luminescence spectrum of calcite from Deming, NM, USA under SW and the Terlingua, Texas, USA calcite. For Terlingua calcite he found a strong band at 410-450nm (purple blue), a bright green band at 450-545nm and a weak reddish band at 545-620nm. The blue long lived phosphorescence have the same spectral bands as fluorescence. De Ment mentioned in 1947 the role of RRE as activator in calcite (Dy, Sm, Y, Ce) and of Thallium (?). The Langesundsfjord: history, geology, pegmatites, minerals, Alf Olav Larsen, Bode Verlag Gmbh, 2010 ISBN 978-3-925094-97-2.